At Fox Piano Tuning we are offering a 20% discount off all tunings/repairs for January. Get in touch to book your piano tuning appointment today! I have a few appointments left for next week. Book now to ensure your piano is tuned for Christmas. Stuck for a present? How about them their piano tuned. Call 0872371541 now to avoid disappointment. Fox piano tuning are offering a 20% summer sale on all repairs and tunings. This offer ends on August 27th 2016. Thinking of selling? or bringing an old piano back from the dead? 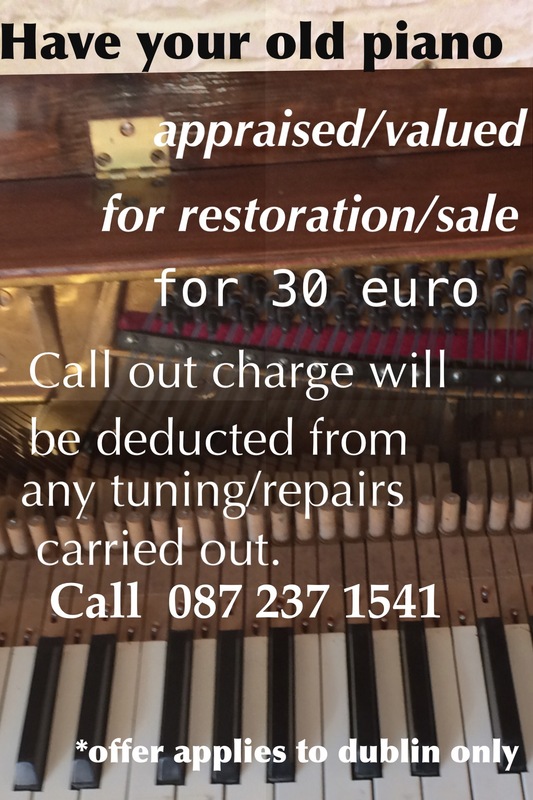 Last week I got a phone call from a new customer just outside of Dublin looking to have their piano tuned. They had just bought it second hand and were told by the seller that it was in perfect condition except for needing a good tune. This is probably the most common description of a piano I see on adverts or donedeal. In this particular case, the customer had spent 400 euro on the piano and then had paid and extra 100 for it to be moved before having it looked over. The piano looked beautiful on the surface but realistically it was a complete write-off. It had missing strings, broken hammers, woodworm, rotting felts and a cracked soundboard. The customer should have paid been paid to take it off the sellers hands. This is not an isolated incident and occurs quite a lot. If you are buying a second hand piano online, make sure you have it looked over by a professional piano technician. It will save you a lot of heartache. Even when you think you are getting a bargain or maybe even getting it for free, it is always worth having it looked at. Pianos do not get scrapped like cars, they get passed on. Always be aware of that. Often times a seller puts a value on a piano based on an emotional attachment to it, when it can quite often be of little or no value to anyone else. There are thousands of moving parts in a piano that can break. It is not just a set of strings that go out of tune. Be smart. Have it looked over before you buy. Start your New Year’s resolution in style with a perfectly tuned piano. Give your self the best possible chance of keeping it up. Or alternatively visit foxpianotuning for more information.